Have you ever considered starting something brand new, trying a new activity, retraining or whatever and then wondered if it’s too late? Me too, but it never, ever is. I remember when I was seventeen, I really wanted to learn to play the guitar but everyone that I knew who could play had been doing so since they were kids, so I thought there was no point. Can you imagine, thinking it’s too late at the age of seventeen? Ridiculous really, but I genuinely thought I’d missed the boat and that I’ve never be able to catch up, so I didn’t bother learning. Two years later, at the age of nineteen, I still wanted to play the guitar and I realised that if I’d just got on with it the first time, I’d already have been playing for two years! I just had to take that first step, so I picked up a guitar, gave it a go, and never looked back. I’ve always remembered what that experience taught me, so these days I aim to not hesitate if I want to try something, I try to just get on with it. Everything and everyone has to begin somewhere so before I know it, I’ll have gained experience and progressed. Stay on the sofa, and I’ll only ever be sitting right there on my arse. A first attempt can take guts. It’s scary putting yourself out there when you don’t know how you’ll fare. But once you’ve got it out of the way, who knows where it might lead? 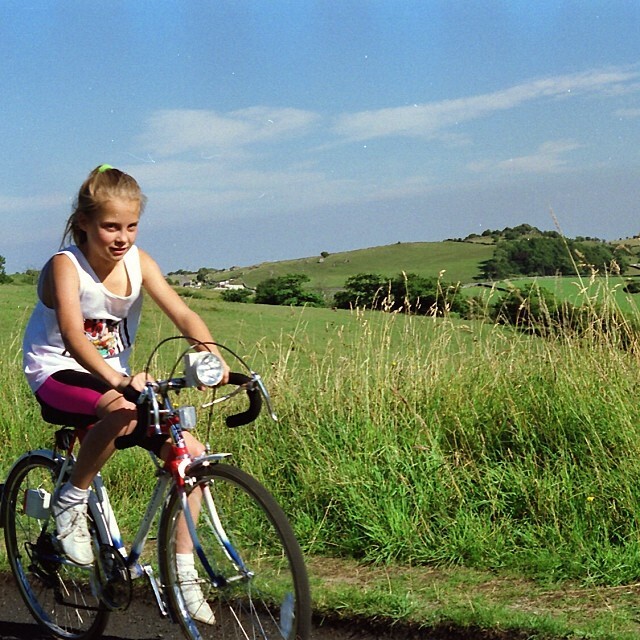 I didn’t grow up with a ‘bikey’ family and came to cycling really late. But thanks to that incident with the guitar, I’m not afraid of taking the plunge and giving stuff a go. Sometimes it works, sometimes it doesn’t. That’s just life, and all part of the fun. Back in 2007, I took the plunge with something brand new and unknown to me when I built my own fixed gear bike. I had no real knowledge of bikes, zero mechanical know-how and no experience of ever riding a fixed gear bike. All I had was a willingness to give it a go and a desire to gain experience as I went along. That desire to try something led me to where I am today, which is an AWESOME PLACE! So always remember, it’s never too late for any of us! What’s really, honestly stopping you? It drives me nuts when people say ‘oh, I wish I did that, I wish I could do that,’ because there’s really no reason that they can’t. Why can I, when they can’t? I never used to ride BMX either….until I decided to start riding BMX! And to further state the obvious, well, I never rode mountain bikes until… I hopped on one. This time last year, I’d never raced Red Hook Crit, and nor did I know that I ever would, but this year, I’m going to race the whole series, because in 2015, I took the plunge and got my first one out of the way. Who’d have thought I’d ever be a bike racer? Definitely not me! Who, or what could you be? Thank you for another good read! I’ve been off the bike’s for a year or so. Work and life got in the way, but now is definitely when! No worries, glad you enjoyed it. Have fun on the bike! Yeaaah! Ride 4 life!… fctrails Chile. Hi Juliet, thank you for your wise thoughts. I’ve always cycled when I was a girl and my 4 brothers always cycled. 2 years ago I bought myself a VTC to cycle to work, it was a first step. Recently I was looking for a ligheter bike and offered myself a good fitness bike. Day after day, I began to improve and found out that I had never settled corrently on the seat ! Now I found the right place on it, I find myself cycling more often standing up on the pedals. Suddenly that technique dispenses me to change the gear all the time. Next step: fixie ! I never thought I would want one (to be totally honest, I always thought that was not for me, when today I feel it’s made for me. There’s a time for each thing, isn’t it ?… thanks for what you do, never stop please.